We were feeling a little classy and metropolitan this week, so we tried our hand at sushi-at-home. It’s always a thrill to sit at our favorite sushi bar and watch the chef maneuver his way through high-grade fish, veggies and that oh-so-sticky rice. Count me as one person who can eat his weight in “Dancing Dragon Maki Rolls”. So, why not try it at home? Thankfully, our staff member Mandie did just that. The key to good sushi, as with any meal, is to use good ingredients. In that regard, sushi-grade salmon (a common choice, and what we used) or tuna is essential. Choosing what sushi-grade actually means can be as murky as a delicious Miso soup, however. A quick search of the FDA website turned up no true regulations of the phrase ‘sushi grade’, beyond a brief description of temperatures needed to destroy parasites. These conditions include “‘freezing and storing seafood at -4°F (-20°C) or below for 7 days (total time), or freezing at -31°F (-35°C) or below until solid and storing at -31°F (-35°C) or below for 15 hours, or freezing at -31°F (-35°C) or below until solid and storing at -4°F (-20°C) or below for 24 hours”. Aside from these federal guidelines, and varying local health department codes, the term sushi-grade fish can be viewed as a nebulous descriptor, at best. That is why we recommend (as always) to get your fish from a trusted, local purveyor. After the fish, you can make your way with all due haste to the nearest market for the rest of your gear. In our case, we picked up some avocado, cucumber, champagne mango and put together a quick spicy mayo sauce (usually done in sushi restaurants with sriracha chili sauce. 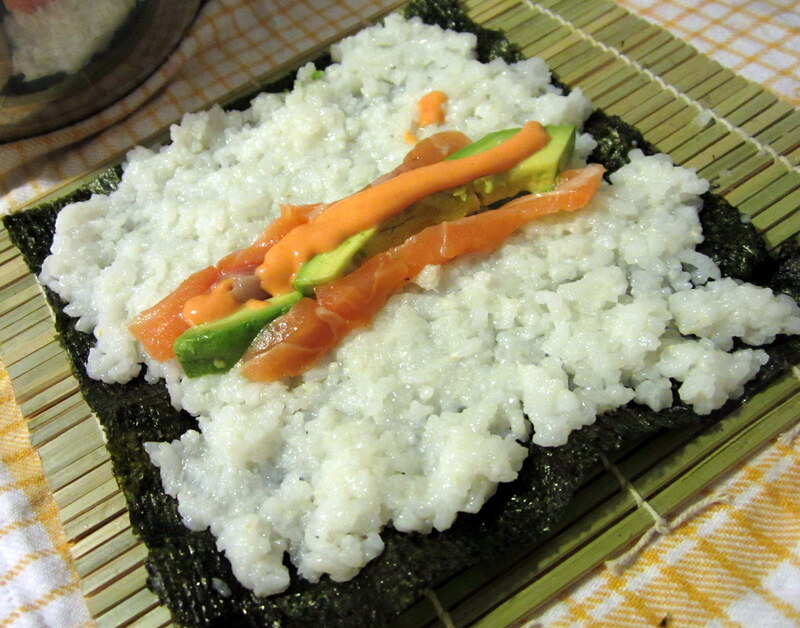 We also used nori, the edible Japanese seaweed used as the ‘wrap’ for sushi, and sticky rice. 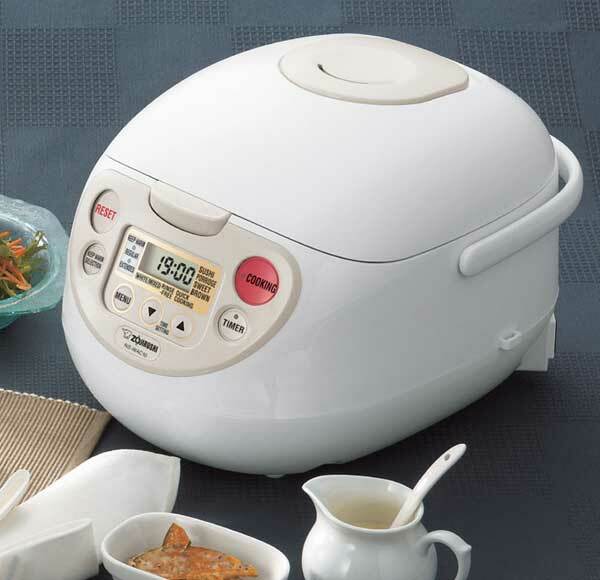 You can make sticky sushi rice at home easily with a Rice Cooker, which can range in price from $20.99 and up, if you’re interested in the higher-end models, like the Zojirushi, which we love. If you’re just dipping your toes into the sushi making pool for the first time, you can also purchase precooked rice at your local sushi restaurant. Many grocery stores also have sushi counters, too. Ask their in-house sushi chef for some extra rice. After you’ve gathered your ingredients, prep everything for the assembly. Since we did a raw salmon roll, no precooking was required. However, many rolls utilize fried shrimp, crab sticks and even asparagus. All you need from here is plenty of water on the side, to continuously dip both your knife and fingers into. Remember, you’re dealing with very sticky rice! You’ll also need some patience. It is very likely that your first attempt will look awful. Just keep in mind, it will taste great either way. We recommend assembling the rolls together with some friends. Or at least with someone who will keep your blood pressure down. More advice? 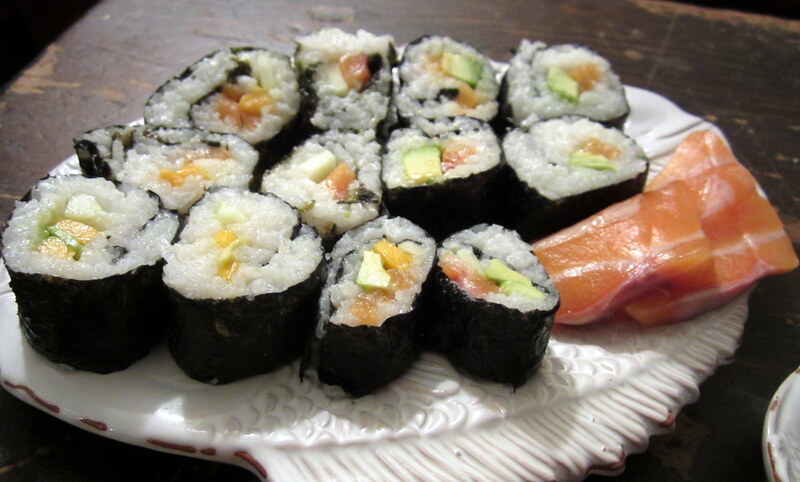 Like shopping on an empty stomach, do not assemble sushi rolls while hungry, either. This may lead to side effects like: nausea, indigestion and overstuffing your nori roll with rice to the point that it bursts out of the sides, splitting your rolled masterpiece. Okay, so we made a funny with the first two, but really, don’t worry about fitting all that rice in at once. There will be plenty of time to stuff your face when you eat dinner! Lay your nori on your sushi mat and add the ingredients. 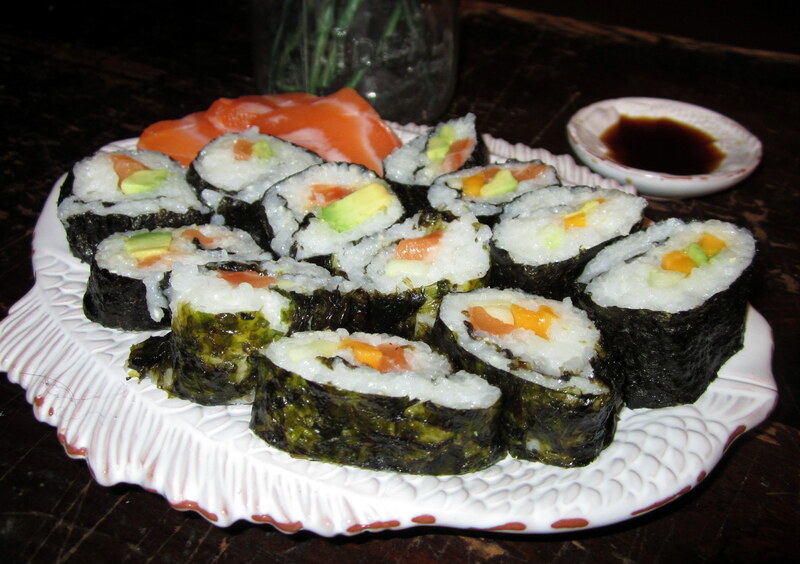 Once your ingredients are portioned, carefully roll your sushi roll onto itself and, as tightly as you can, into a roll. In order to slice into portions, sushi chefs have traditionally used a uber-sharp, single-bevel knife. Usually a 10″ or longer slicer, these knives allow the user to pull the blade through the food for a single, clean cut instead of using a sawing motion, which would shear the food. The Kershaw company produces a great option, the Shun Pro Yanagiba, which is available from Fante’s via special order. While it can be used for sushi, you can also pull it through your Thanksgiving turkey and other roasted meats. You’re at home, so there isn’t a pressing need to fumble with chopsticks like we did. Of course, if you do prefer chopsticks, we like the 20-pack of bamboo chopsticks (for serving a crowd), travel chopsticks (for mobile sushi) or the Joyce Chen Rookie Stix (for sushi eaters-in-training). 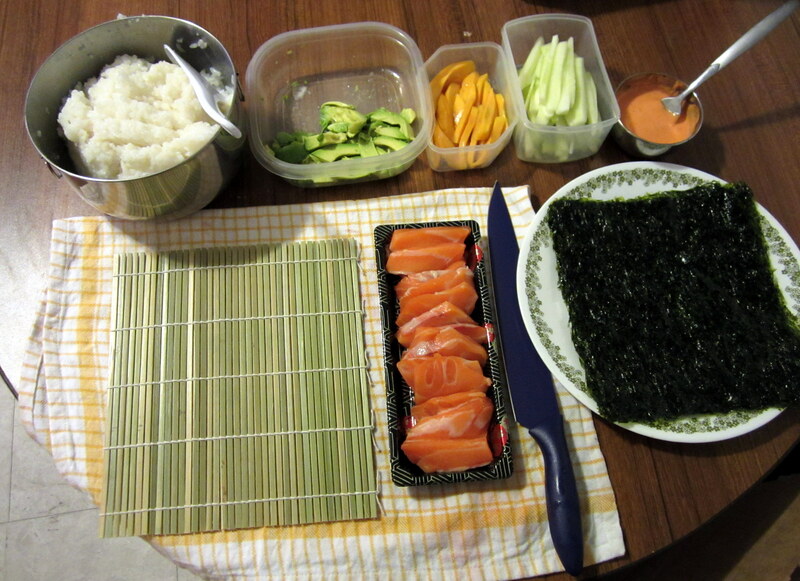 Big thanks to Mandie for the photos, and for showing how to make great, simple sushi! Thank you for the help. I had sushi for the first time recently and loved it. I would love to try different ingredients like you’re talking about. The assembly actually looks easier than I would have thought. How long does it usually take to make three or four rolls?